Christmas morning usually produces quite a mess. Wrapping paper, boxes, and gifts litter the room, and it can seem quite overwhelming to get everything cleaned up, organized, and put away. I find it so much easier to relax and enjoy the day when we do a few things to helps us have an organized Christmas morning, and it saves me so much time in the long run. 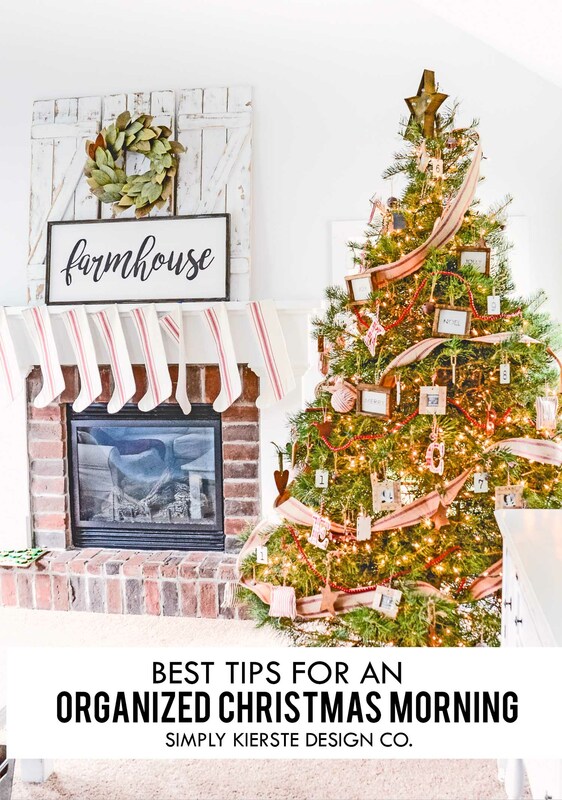 I’m sharing with you my tips for keeping the mess under control, giving you a little extra time (and sanity) on Christmas Day. They are simple ideas that can be done ahead of time, with very minimal prep, but will make a huge difference! With six kids and eight people in our home, these few tips have most definitely saved me a lot of time. This post contains affiliate links. If you click on a link and make a purchase, I receive a small commission at no extra cost to you. If you have purchased gifts that you know will need to go in a storage bin, or be organized…i.e. Legos, Lincoln logs, trains, etc., it’s a good idea to purchase storage bins ahead of time and have them ready to go for Christmas morning. Once all the boxes are opened and trash is thrown away, you already have a place for toys to go, and they’re not being shoved into a corner, or left scattered around. This saves my sanity on Christmas morning…I love being able to give a gift and already have a place for them to go. Set out a box or bin for each child and label it with their name. When they open a gift, they can put that item in their own box, so it stays organized, and keeps all of their things together. It will eliminate lost parts, items, and will help immensely with the clean-up process. Kids will also have an easier time putting away their gifts if they’re all together! We’ve always unwrapped our gifts one at a time, starting with the youngest and moving to the oldest. We do this for several reasons. We all get to watch and see what each person is receiving, it gives the recipient an opportunity to thank the giver properly, we get to celebrate the gift-giving as a family, and last but not least, it it much easier to keep all the trash and chaos under control. We would do it even without the organization element, but it’s definitely the icing on the cake. I like to set out trash bags the night before, in preparation for the next morning. As soon as a gift is unwrapped, the paper goes right into the bag. It takes less than 10 seconds, but somehow it saves an hour or more of clean up in the long run. If a gift is in a bag with tissue paper, I have a bin ready to go for the bags and paper to go in, so I can easily put them away later. Santa usually stuffs our stockings with a lot of candy and small items, but he also brings storage bags for them to go in! When my kids dump their stocking out, I hand them a bag with their name written on it in Sharpie, and they can put all their candy and small treasures inside. It helps them keep track of it all, it doesn’t get scattered around the room, and the clean-up is definitely cut down. That’s it! Simple, quick ideas that will help keep an organized Christmas morning, and make the whole day more enjoyable!